Numbering over 26 million, India’s micro, small and medium-sized enterprises have a huge opportunity to build world-class businesses today. What the country needs is an MSME-focused, integrated approach encompassing policy change, infrastructure build-up and extensive technology use. There is a wide window of opportunity lying open for the enterprises in 2012, thanks largely to the new government initiatives last year and the more to come this year. First, a look at what 2011 held for MSMEs. The last year brought many positives for the smaller units. Since SMEs are highly susceptible to market volatility, many countries have public procurement policies in place to support them, ensuring a fair share of market for such firms. Bridging this gap for Indian MSMEs, the Centre has made it compulsory for central ministries and public sector undertakings to procure 20% goods and services from domestic micro and small enterprises. This will protect the sector from market fluctuations to a large extent and provide ample scope for these enterprises to grow. Another key takeaway from 2011 was the positive moves towards implementation of the goods & services tax (GST) regime. From the MSME perspective, GST will eliminate the cascading effect of multiple layers of taxation. Bringing all indirect taxes under a few slabs will improve the economic efficiency of MSMEs, besides simplifying the tax structure. Last year, to reduce the burden on SMEs from the global economic crisis, the government announced a 2% interest subsidy on rupee export credit. The apex bank expects that the subsidy will partly compensate exporting MSMEs for the slowdown in major markets like the US and Europe. A major concern for Indian MSMEs, however, was the increased competition from cheap Chinese imports. Caught in a vicious circle, MSMEs were faced with high interest rates and rising raw material costs. These affected exports. Delayed and lower credits added to the enterprises’ woes. The key concern for MSMEs during 2011 was financial non-viability stemming from changing business environment, lack of demand and infrastructural constraints. However there is no denying that the positives of 2011 have set a good pace for the year 2012. The proposed SME Exchanges by BSE and NSE will provide the enterprises a platform to raise capital and increase their market valuation, which will surely boost their growth. Moreover, benefits from the Regulation of Factors Bill 2011 that secured Parliament clearance are also expected to come in this year. While the bill is meant for all classes of industries, it will be interesting to see how MSMEs derive advantage from it since factoring will help mitigate their cash-flow problems. Internet technology adoption among SMEs has been picking up speed, and the momentum will increase in 2012. This will help MSMEs organise their enterprises better, do operations seamlessly and build competitiveness. While there are positives to look forward to, MSMEs should also shield themselves against potential challenges that might emerge in 2012. Common issues such as credit crunch, limited access to financial sources and infrastructural constraints may still ail the smaller units. The economic and financial uncertainties in the global market may be a prelude to toned down export figures this year from reduced demand in the international markets. Since growth of the MSME sector can translate into growth for the economy, MSMEs will always remain a key focus for the government. 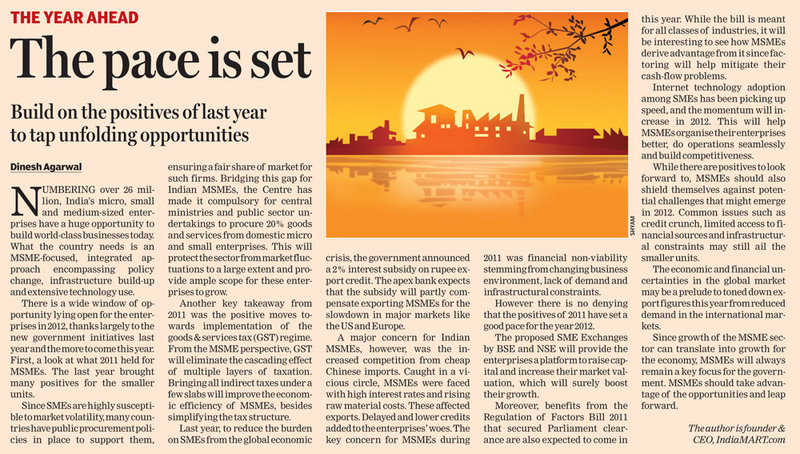 MSMEs should take advantage of the opportunities and leap forward.